It was the end of the 70s. Star Wars had blown America away and its comic adaptation had saved Marvel from bankruptcy. Bill Mantlo and Michael Golden had gotten Mego’s eponymous Micronauts off to a roaring start and it was clear that toy properties being turned into comics was a marriage made in accounting heaven. The comics promoted the toys and vice-versa. 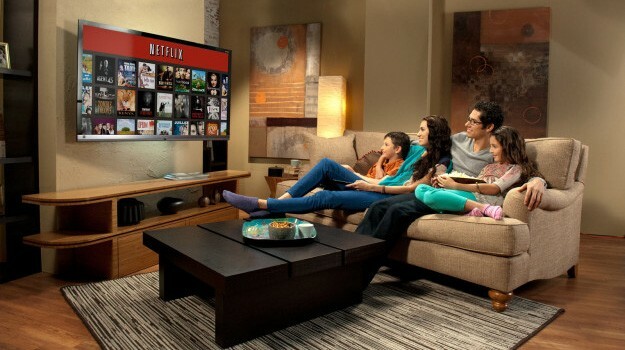 Artists and writers even inspired future products. In the case of Hasbro’s G.I. Joe line, Larry Hama was singularly responsible for crafting all the new Joes we loved in the 80s. 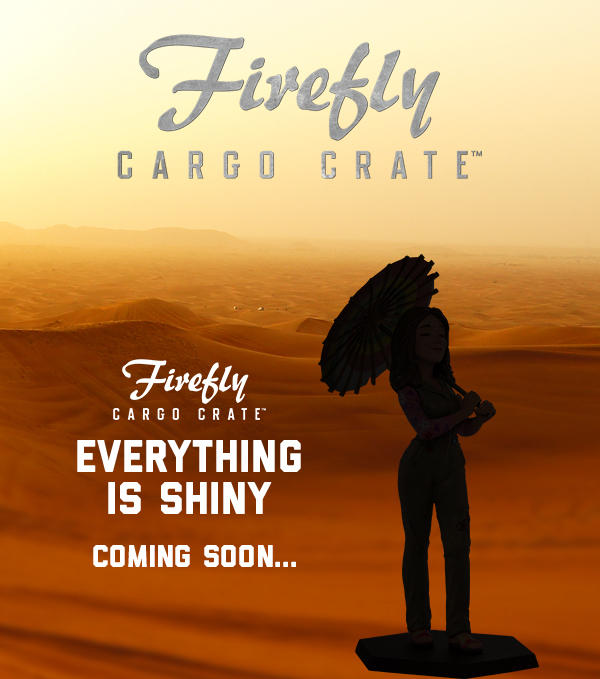 That was a definite Win-Win for Marvel and Hasbro. But before the success with Hasbro, there was Parker Brothers and their newest – and only – action figure with blinking lights and sound: ROM the Spaceknight. 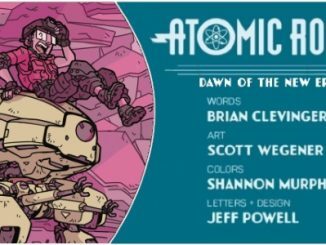 Originally conceived as a wizard with sound effects, creator Bryan “Bing” McCoy re-imagined him as a cyborg fighting evil named “COBOL” (after the old business programming language). Execs at Parker Bros. renamed him “ROM” for “Read Only Memory” and the rest is… well, not exactly history. More like a tale of survival. You see, after Bing McCoy’s rather interesting LED-blinking, sound generating, Spaceknight from the “Solstar Order” was on the toy shelves for a year or two, it was abandoned. It looked and sounded cool, but it had too little articulation and no other supporting figures, not even his supposed arch-enemies the Dire Wraiths. Though they were discussed at Marvel, nothing came of it. And so, ROM Spaceknight as a toy was no more. That would usually mean the end of the comic, but something happened that no one, not even Bill Mantlo, predicted. ROM Spaceknight, the comic, kept selling. 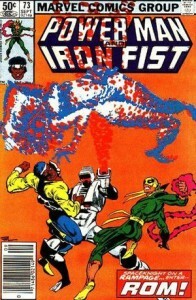 From December 1979 to February 1986, ROM went the distance for 75 issues and four annuals. 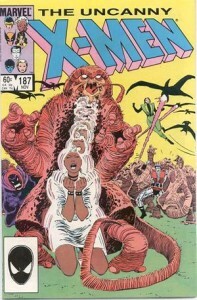 In 1983, it sold 162,000 copies and was Marvel’s 15th best seller of their line. In 1984, it outsold Captain America, Batman and Superman. ROM was liked. I mean a lot. 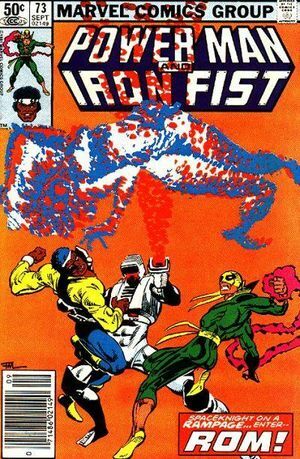 And, like Micronauts, it soon crossed over from its smaller setting into the larger Marvel Universe. However, unlike the diminutive Micronauts who had their own Microverse, ROM stayed here in Universe-616 wooing us. He had many relationships and team-ups within the Marvel Universe, including some minor heroes like Power Man and Iron Fist, major characters like Prince Namor, the Sub-Mariner, and Forge from the X-Men and even got married to a woman named Brandy Clark. What made ROM Spaceknight such a worthy read? I see several reasons: old-school storytelling, classic Marvel vibe of man-as-monster, coupled with a simple sci-fi concept of a strange visitor from another world comes to a small town. Mix in some Cold War-era concerns about fifth columnists, some pre-X-Files paranormal spookiness, and ROM had plenty of playroom for paranoia and sinister threats for him and his newfound friends to face. All this was de-rigueur for writer Bill Mantlo, Jim Shooter’s go-to guy for last minute stories. When deadline doom approached and a story was needed on Monday, Shooter could ask Mantlo on Friday and get it. Bill wrote and wrote and wrote. His bibliography reads like a Marvel checklist (you remember those, don’t’cha bunky?). But besides a devoted fan base and a good pedigree of creator/artist combos, what was it that made ROM Spaceknight worth reading and re-reading? What made ROM, the cyborg warrior from golden Galador, so beloved that Chris Ryall has moved heaven and Earth to get the rights to bring him to IDW for a re-launch in 2016? It was simple kids. 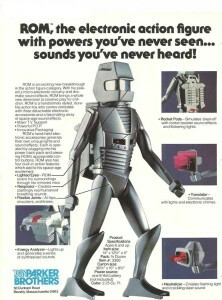 ROM was a hero for all ages. You could be seven or seventy, and you understood ROM. He was a man turned into a machine, a veteran on a foreign battlefield, a poet who had lost his humanity, a man who fought demons daily but deep down inside he was a romantic buried under technology. ROM was all that and more. 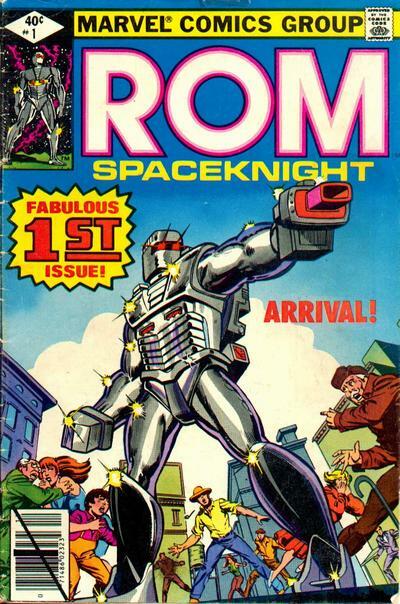 ROM Spaceknight was a medieval romance or, if you prefer, a Greek epic for modern times. If Star Wars was a space opera, and Star Trek is science fiction, then ROM Spaceknight was a galactic epic. He was Odysseus returning home to find he’d been betrayed. He was Christ leaving heaven to cast out demons on Earth. He was astronaut Steve Austin, a cyborg serving his country. He was Rambo coming home to find his friends crazy or dead by the bureaucrats they’d served and the locals hating him for being different. ROM had it all. He was a man – a poet – who gave up his humanity two hundred years ago to wage war on an insidious foe that strolled through the halls of power and preyed upon our family and our friends. He was a man so noble, so right, so true, that an Earth woman fell in love with him merely because of his character. He was Superman [alien], Batman [obsessive], Captain America [anachronistic patriot], Thor [warrior], and Iron Man [hi-tech] all-in-one. His moral goodness was so great that when the villainous Rogue kissed him she was struck dumb. Fans of Rogue may well mark this event as the reason she went from being a strict villainess to a woman seeking redemption. So ROM did that for the Marvel Universe. He outwitted Galactus so wisely, he made the Devourer of Worlds laugh. 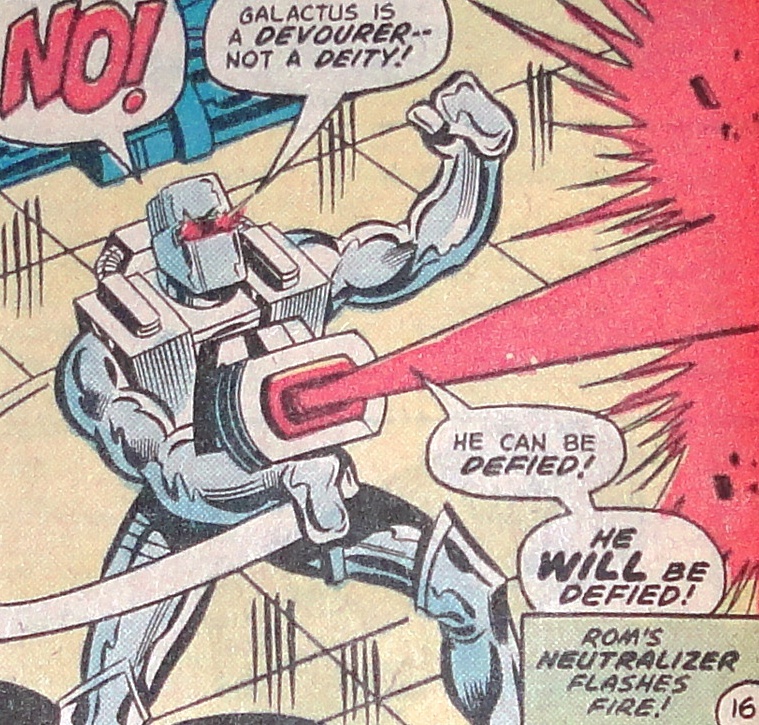 But I think ultimately, when pressed, what made ROM Spaceknight so great was that ROM was a hero who absolutely, utterly, and decisively would not stop fighting evil, even at the cost of his own body, his loves, and his home. He truly was a hero’s hero. You could even say he was a superhero’s superhero. So when that seven foot tall, red-eyed cyborg sheathed in living metal summoned his Neutralizer from subspace to banish Dire Wraiths said, “Wraith scum! Is there no end to your filth? ROM shall make an end!” – you got the distinct impression that goodness could be far more terrifying than badness. You wanted to be on ROM’s side. You really, really did. Because nothing could stop ROM. Not pain, not despair, not loves lost, not worlds destroyed. 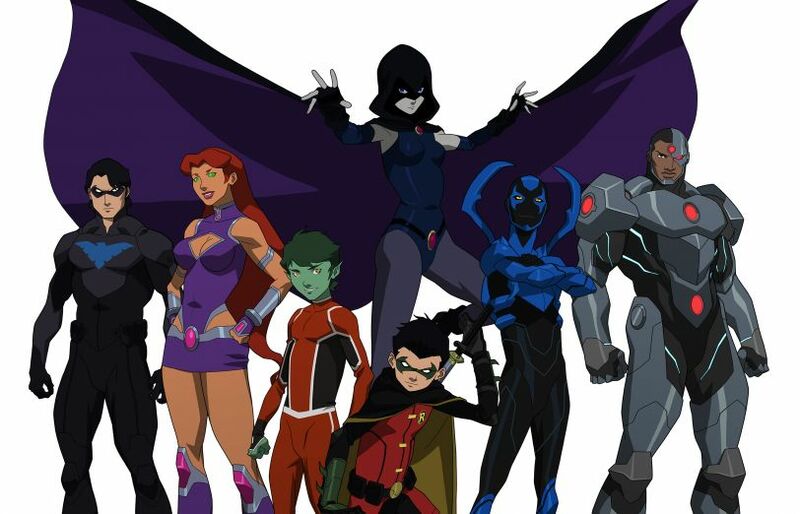 Not even comic book cancellation. Long before Arnold Schwarzenegger uttered those famous words, you knew. You knew he’d be back. Amen. And now for your viewing pleasure, the original ROM Spaceknight commercial! Bill Mantlo, writer of both Hulk and ROM, finally manages to get the two together. On page 14, at Rick Jones’ wedding, ROM and Brandy make their only in continuity appearance between ROM #75 and Spaceknights #1. The Thing teams up with ROM. Occurs between ROM #22 and #23.